Top row from left: Jeremy Litchford, Aaron Smith, Ciara Riddle, Hailey Summers, Tabitha Stone, Brooklyn Gunter, Nellie McAleer. 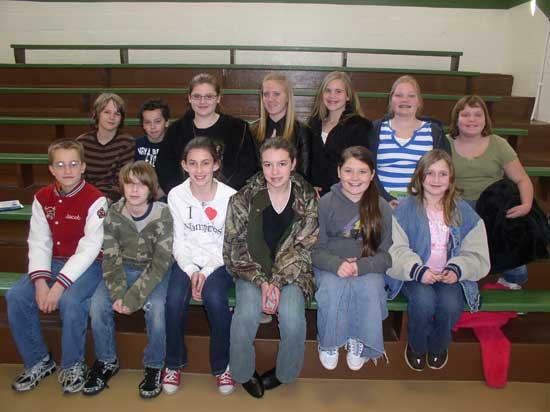 Bottom row from left: Jacob Stone, John Nicol, Caitlin Miller, Katie Underwood, Savanna Murphy, Miranda Dyer. Each six weeks every sixth grader sets a point goal for the Accelerated Reader computer program. Those who meet their goals get 100 for 10% of the reading grade as well as some kind of food treat. For the third grading period everyone in the class made his or her point goal. The class total was 310.9 points. Besides that, there are several notable scores. Brooklyn Gunter and Jeremy Litchford each made 100% on every test. John Nicol had 68.4 of 70 possible points. Aaron Smith had 40.2 of 44 possible points. Ciara Riddle, Tabitha Stone, Hailey Summers, and John Nicol each missed only one question for the six-weeks. It's great to see students inspired to read. Keep up the good work.